Big C Roars into DesignerCon! As DesignerCon creeps ever closer to starting, we wanted to show you this absolute badass custom that Big C will have on display & sale at his DCon Booth #1012! 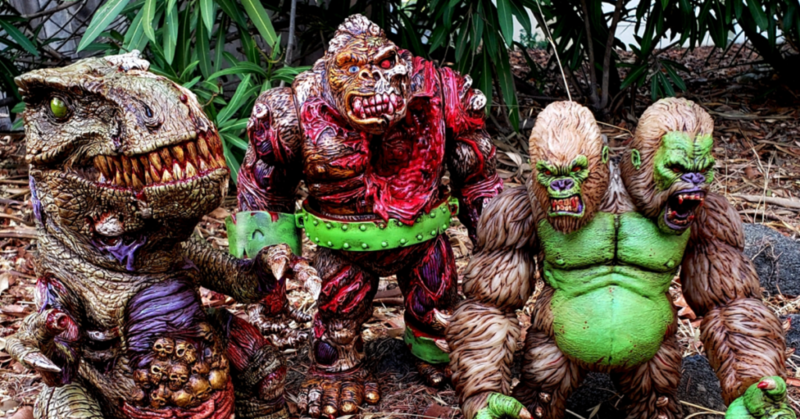 Check out this custom Rotten Rexx originally released by James Groman. Big C went somewhat realistic with his paint job on this Rotten Rexx, and he didn’t disappoint with the blood! Gory AF! Not only will Big C will have this beastly custom on his booth, he will also have a custom King Korpse & Goliathon too. Big C ain’t called Big C for going in small, he goes in BIG! These are incredible, and will no doubt attract a lot of attention this week in Anaheim! Some of Big C’s announcements have been: GID orange Baby Fatts (ok, he hasn’t announced that yet but it’s coming), 20+ 0ne-off Baby Fatts by Task 1, the West Coast debut of his children’s book, Baby Fatts: The World’s First Dragon, two limited edition prints, shirts featuring his new Baby Drips design, four different Zapped Cans, custom Prisoner XL, Ravenous, and Stormtrooper helmet. Damn, boy has been busy! Go check out Big C on booth #1012 and give him some love on Instagram HERE. Don’t forget your DCon tickets, as we’ve not mentioned them in a hot minute or two. You can grab them HERE.